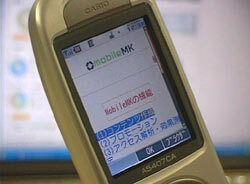 It’s been a fairly hectic six weeks for Japan’s mobile industry and therefore also for us here at WWJ. Starting with the Tokyo Game Show in late September, followed in short order by CEATEC and DoCoMo’s new 903i-series launch — and combined with the MNP (mobile number portability) official launch on 24 October — it’s been crazy. Your WWJ staff have also been deep into planning next week’s Mobile Intelligence Japan (MIJ) mission, due to start on Sunday afternoon and we have over 250 folks registered for our next Mobile Monday event at the Canadian embassy on Monday 13 November! Phew! We know how much everyone enjoys watching our web video programs and so we’ve bundled a few together that were finally produced over the last little while. The Tokyo Game Show was, as always and then some, a super event this year, celebrating their 10th anniversary and was held at Makuhari Messe; WWJ saw previews of DoCoMo’s 903i “Mega Games” while KDDI was running a massive (mobile) multiplayer Bomberman exhibit and SoftBank Mobile stepped out if full force with a wide selection of games targeted at Sharp’s 905SH handset. Also, we have added our video coverage from DoCoMo’s new 903i-series launch (Flash site here), which introduced a whopping 14 new handsets complete with some interesting 3G data service upgrades as well. Finally, DoubleClick Japan introduced their “Mobile MK” software and were kind enough to show us a full demo — along with their new “Mobile Analytics” suite. Both full-length videos run about 20 mins each and are available only to WWJ subscribers after the jump. — Yoroshiku! Any one of these latest program additions would be worthy of a several hundred word op-ed. However, as mentioned, we really are running pedal to the medal here this week (and next week too), so for the time being please just sit back and enjoy the extended versions — in windows media player only — of our demo. 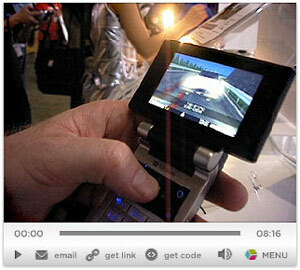 with DoubleClick and extended highlights from Natsuno-sans presentation for DoCoMo’s new 903i-series handsets.